A Pathfinder Society Scenario designed for levels 5-9. Few places on the Plane of Fire are as rich in folklore, opportunities, and material wealth as the City of Brass, and it is there that the disgraced efreeti Qalkami aims to reestablish her credentials with the Society's help. Only by teaming up with this genie—at least in name, if not in spirit or practice—can the PCs both secure the secrets she owes the Society and help topple a major fixture of the City of Brass. None are better equipped than Pathfinders to infiltrate forbidden districts, crush an evil operation, and make the most of the chaos that ensues, but in a metropolis built largely of superheated metal, can the PCs take the heat? Content in Cleansed With Fire also contributes directly to the ongoing storyline of the Exchange and Liberty's Edge factions. 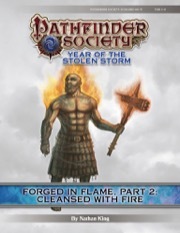 Cleansed With Fire is the second scenario in the two-part "Forged in Flame" campaign arc. It is preceded by Pathfinder Society Scenario #8-09: The Cindersworn Pact. Both chapters are intended to be played in order. Note: This product is part of the Pathfinder Society Roleplaying Guild Scenario Subscription. In the previous part you were tasked to do some errands. This part is no different, except that you also get some additional particular faction-specific sidequests. This time around though, the emphasis was more on stealthy or deceptive approach, similar to those found in such gems as The Library of the Lion or The Disappeared. While our party wasn’t necessarily made for this, we embraced it regardless. That tasks themselves made sense and I really enjoyed the Azer splinter faction, but I honestly wasn’t impressed. That’s not to say it was bad, but rather that there was little that sets this scenario apart from others or makes it memorable. This is mostly due to the setting of the scenario, or I should say the lack of it. While the Plane of Fire and it’s denizens do get addressed on the first few pages and while you do encounter fire-themed opponents, this scenario could literally have been anywhere. You can just grab the efreeti and elementals - which I should add were rather unimaginative and relatively boring foes in this case - and toss them in an Osirion temple or Taldor estate, and you’d end up with exactly the same experience. This is a problem that is shared with most of the elemental scenarios this season and it honestly is quite a substantial one. Paizo should put more effort into making these planes meaningful by having them somehow influence (parts of) the scenario or have some sort of other meaningful impact. Descriptions alone are not enough, regardless of how good and elaborate they are. Some authors thankfully still manage to sneak in a room or mechanic, but in this case there’s no Plane of Fire specific mechanic that makes it feel like you’re indeed on the Plane of Fire. I consider that to be a major disappointment. Part one suffered from the same issue, but had excellent ethical dilemmas to counterbalance that. This part, while still not bad, provides a relative bland infiltration. As such, I fear I have to say it’s not as good as the previous scenario. While a party can still have fun and tackle this scenario like it’s Mission Impossible, I’d recommend other infiltration missions instead. Again, it’s not bad, but it’s also not memorable. I’d still recommend this series over the Tyranny of the Winds as the storyline is far, far better. Besides, if you’ve played the great prequel to this scenario, you might as well finish it. Just don’t expect miracles. I ran this for a group of 6 in high tier with the 4 player adjustment. We had a fun time but the scenario, as did its prequel, lacked anything memorable that would make it stand out. It also did not feel particularly tied into the Plane of Fire or the City of Brass. The intrigue that the PCs get involved in could just as well take place anywhere else on Golarion (or, in fact, the multiverse). The final fight was a little unsatisfying: the Tactics of the BBEG did not make good use of his strongest abilities, favoring melee (!) over spells. The 4 player adjustment also removed his minion, which made the encounter feel even more trivial. Also, the final piece of information that the PCs spent two scenarios chasing after in the end feels tacked on and is in no way connected to what goes in the scenarios. In summary, this two part series is really nothing to write home about, but it also is not a total train wreck. So if it is offered and you have no other options, go ahead. If there are other tables, you might want to put a pin in this. 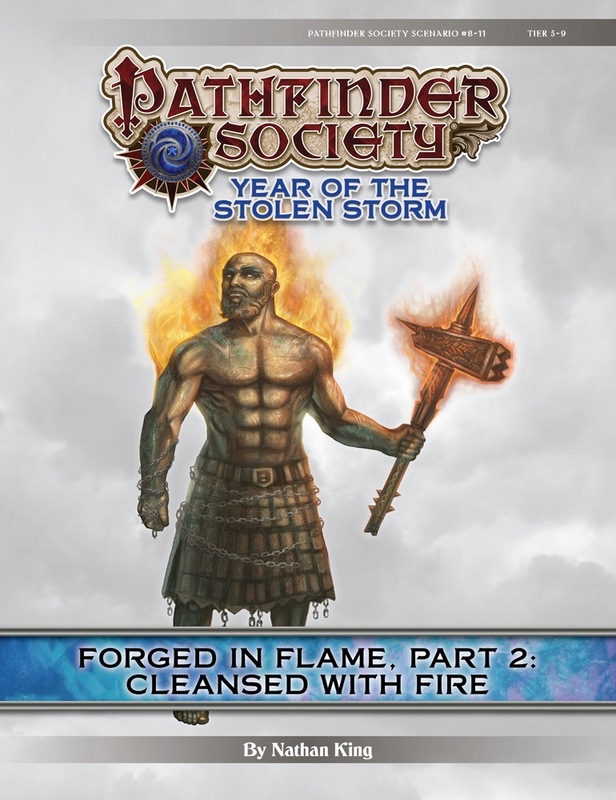 I don't just dislike the Forged in Flame series, it is my current go-to series for everything that is wrong with the way we portray Pathfinders. Go read my review for Forged in Flame Part 1'. No really, go for it. I can wait. Now, that out of the way, this scenario was better. Why was it better? It didn't fall into the mechanical traps Part 1 did. One character couldn't dominate the series. The crazy loot penalties and failure conditions are eliminated. I even mentioned that Part 1's combats weren't awful, and that applies to Part 2 as well. These are good things. But why was it "not much"? Well for one, the scenario drives you right back into the world of the Murder Hobo. Except lets not call it Murder Hobo, let's call it what it is. It's the world of a Petty Burglar with a side order of Murder Hobo. Where Part 1 sets you up for really, really horrible things, Part 2 at least just has you doing one generally very, very unlawful thing. Of course, unlike last time, be ready for that atonement for your Hellknight or Paladin, because there's no way around it for this "adventure". While you're set up for systemically dismantling your patron's horribly evil plans in Part 1 if you do that in Part 2 you're not succeeding at all. To be clear, Part 1 sets the precedent that there is an "out", but there is not in Part 2. And herein lies the core of my utter disdain for this series. We are set up on a path that involves B&E, theft, murder of a head of household, and killing of guards. Our leadership tells us we're doing it for noble reasons (although that's not clear either, since all we're dealing with is the criminal underbelly of the Society), but it is absolutely clear we're assisting something evil at it's core. Worse yet, we're not even given suitable evidence that the evil we're eliminating is worse than the evil we're assisting. It's the classic two wrongs must make a right story, which is a story I don't really need to participate in. I would have loved an out, something where my good or lawful aligned character doesn't have to feel like I can't act because every action is counter to their character. So there you go. I'm sure plenty of people will love feeling like true criminals. Personally, I just wanted it over. I got to play this with the author at a local convention, and it was a blazing good time. I brought an Ifrit Fire Sorcerer to this, figuring he would be up to the challenge (he has a decent spread of evocations at his disposal). I wasn't wrong, but boy was I still in for a challenge. Nathan did a great job balancing a wonderful location with some great social and possible combat interactions. I also felt like I actually got to play my faction in this one. Great game, and super glad to have played it. The fact that my Ifrit Paladin is out of tier for this makes me incredibly sad. City of Brass! Cool or should I say...HOT!